Enjoy an environmentally-friendly, car-free and relaxed winter holiday on the Kronplatz – with the HOLIDAYPASS PREMIUM you can travel free of charge on public transport throughout South Tyrol, visit museums and leisure facilities at preferential rates and take part in all the events in the Kron Aktiv Winter weekly programme. Make the most of the benefits of free mobility and explore the sights of our holiday region. 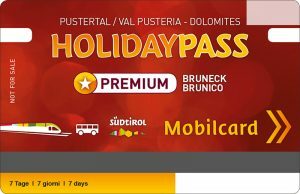 *This campaign is reserved for guests of the member establishments of Bruneck Kronplatz Tourist Association. Anyone looking to learn new jumps, skills and tricks with their snowboard will be in just the right place with our snowboarding coaches. Is there anything more lovely than gliding through the glittering winter landscape on cross-country skis? Hardly! If you want to try out this healthy and truly enjoyable type of winter exercise, then this two-hour taster lesson is your chance! Treading softly – on our weekly snowshoe walks we roam together over untouched snowfields and enjoy the silence of the magnificent natural surroundings in the Val Pusteria-Pustertal Valley. A special highlight for hiking lovers well away from the hurly burly of the ski slopes! Freestyle – a truly individual style of skiing on specially developed skis. Anyone looking to take on this hip variant of skiing will be in just the right place with our freestyle coaches.